CelebrateGreece.com’s James Stathis and Cynthia Daddona backstage on Broadway with fellow American-Greek Constantine Maroulis, star of Rock of Ages. 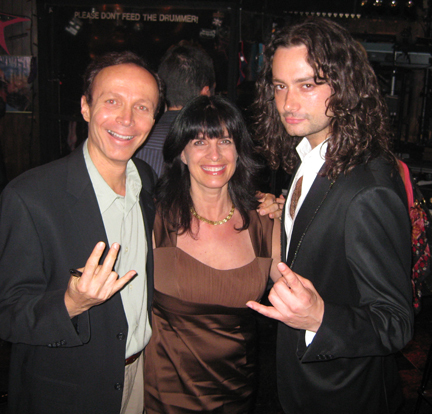 Constantine Maroulis stars in Rock of Ages on Broadway. CelebrateGreece.com’s Cynthia Daddona and I were in New York City and wanted to see our fellow American-Greek Constantine Maroulis of American-Idol fame on Broadway. Currently, he has the lead role in the musical comedy “Rock of Ages,” where he plays Drew, an aspiring and shy rock-n-roller from Michigan who falls in love with a small town girl in LA’s most famous rock club on the Sunset strip. This love story, set in the ‘80s, is told through the music hits of the era, ranging from Journey to Pat Benatar to Whitesnake and many more. Constantine’s soulful singing and acting make for a moving performance. Based on a book by Chris D’Arienzo, “Rock of Ages” is filled with humor and nostalgia that will have you singing to the tunes of the ‘80s and howling with laughter before you know it. In this show, dreaming big and love conquers all in the midst of rock n’ roll reality. We were delighted to go backstage to congratulate Maroulis on his success. CelebrateGreece.com has also enjoyed interviewing Constantine several times at numerous American-Greek events across the U.S. and in person we have found him to be intelligent, polite, humble, and proud of his Greek heritage (To see Cynthia Daddona’s three interviews with Maroulis, and others at the LA Greek Film Festival, click 1, 2, 3). Born in Brooklyn and raised in New Jersey, Constantine described himself as a theater geek growing up who attended Greek school and wanted to be a rock n’ roll star. Besides appearing on “American Idol’s” Season 4, he has been on Broadway’s “Wedding Singer” and “RENT.” His performance in “Rock of Ages” earned him a 2009 Tony Award nomination for Best Actor in a Musical. 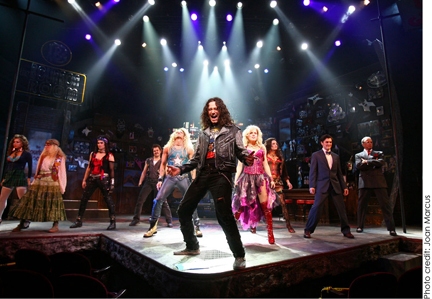 In the same year, the show “Rock of Ages” was nominated for four other 2009 Tony Awards for Best Musical, Best Direction, Best Costume Design, and Best Sound Design. Cynthia Daddona's dress by Donna Ricco.